Process variation affects how resulting products and services appear to Customers. This appearance includes not only the item's variability, but variation from the item's measurement. For example, you measured the thickness of a pair of glasses' lens. Then you ask three other people to measure the lenses. It is highly likely that there would be a difference in answers between everyone. It is also highly likely that if someone handed you the same pair of glasses later (without you knowing it was the same pair) and asked you to measure again, you would come to a different measurement. The pair of glasses did not changed. The measurement system caused the different answers and specifically errors within it. The higher the measurement error, the harder to understand the true process capability and behavior. The sole purpose of a continuous data measurement system is to collect the right data to answer the questions being asked. To do this, the team must be confident in the integrity of the data being collected. To confirm data integrity the team must know. Validity. Are your measuring the right aspect of the process or product? The continuous data might be from a reliable method or source, but still not match the operational definitions established for the project. Reliability. Is the valid measurement system producing continuous good data? This considers the accuracy and consistency of the data. To confirm validity and reliability, one uses a Gage R&R to conduct an audit on a continuous data measurement system. This involves using multiple people,multiple items, and multiple measurements to complete the audit . Each person measures every item at least twice. The Gage R&R data determines. Gage R&R study examines the whole continuous data measurement system including the test samples, people, techniques, and methods. Many people confuse a Gage R&R Study with tool calibration but the two are different. Calibration considers only the reading and comparison to a known standard. Gage R&R is significantly different and often far more difficult. It analyzes the entire variation within the measurement system. The total process variation comes from the true process variation and the continuous data measurement system. To effectively see the process variation, the variability due to the measurement system should be small. Repeatability variation occurs when repeated measurements are made of the same variable under absolutely identical conditions. It is the variation between successive measurements of the same sample, of the same characteristic, by the same person using the same instrument. Poor repeatability causes an increase in decision error. When the same person looks at the same characteristic and measures different values he makes different decisions. Some of these decisions are the wrong decisions! Source: SBTI's Lean Sigma Methodology training material. Reproducibility variation comes from different people making measurements on the same items using the same instrument. We examine this variation with different environmental conditions such as time, environment, temp, work conditions etc. When two or more individuals return the same value for a given characteristic, that measure is said to be reproducible. Source: SBTI's Lean Methodology training material. The P/T compares the size of the continuous data measurement system error with respect to the size of the specification. 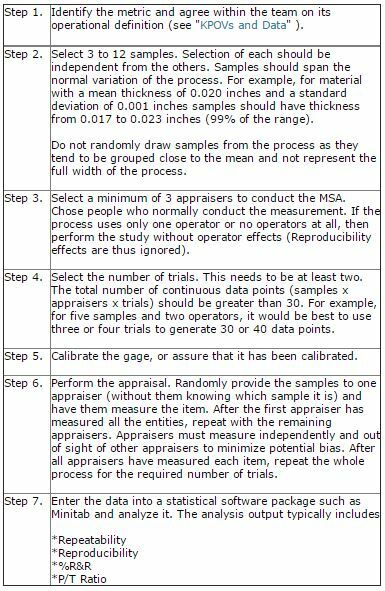 Since all measurement systems have variation, this metric lets you know if your measurement system variation is acceptable (or minimal) to measure a characteristic. The P/T Ratio represents the percent of the specification tolerance taken up by measurement error. The metric includes both repeatability and reproducibility. An excellent continuous data measurement system has a P/T Ratio less than 10%. A value of 30% is barely acceptable. 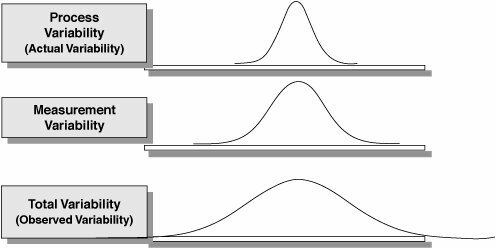 5.15 standard deviations account for 99% of Measurement System variation. The use of 5.15 is an industry standard, but more recently some texts recommend the use of 6 standard deviations, which represents 99.73% of Measurement System variation. Either value is appropriate provided you use it consistently across the business. An excellent Measurement System has a %R&R less than 10%. A value of 30% is barely acceptable. The Range Chart should show a process that is in control. Repeatability is questionable if the range chart shows out-of-control conditions. If a point is above the UCL, that operator is having a problem making consistent measurements. If the range chart for an operator is out-of-control and the other charts are not, then the method is probably suspect. If all operators have ranges out-of-control, the system is sensitive to operator technique. The Range Chart also helps identify inadequate discrimination. There should be least five distinct levels (points along the Y axis) within the Control Limits. Also, if there are more than 1/4 of the values at zero, then again, discrimination is suspect. For the Xbar Chart by operator, this is the average reading of each item measured. Due to part to part variation, the majority of the points on the chart should fall outside the control limits. In addition the pattern of the reading needs to be consistent for all the operators. If not then the reproducibility is suspect. If there are no points outside the control limits, then the selected samples did not cover the full range of the process (i.e.., there was not enough part-to-part variation). Below is an example of an Operator-Part Interaction Plot. For a reliable continuous data measurement system, the lines should follow the same pattern and be reasonably parallel to each other. Crossing lines between operators indicates significant interactions. Also the part averages should vary enough that the differences between parts are clear. Below is an example of a Gage R&R by Operator plot, which shows the average value (Circle) and the spread of the continuous data for each operator. The spread should be similar across all operators and there should be a flat line across the means of the operators. The P/T Ratio (listed as the %Tolerance) at 68.61%. This gage is clearly not suitable as a production gage (30% is acceptable). The %R&R (listed as %Study Variation) at 32.66%. This gage is less than acceptable to help make improvements to the process in question (30% is acceptable). The majority of the variation comes from reproducibility, which can be seen from its standard deviation (0.056088) versus repeatability (0.035940). Appraisers aren't agreeing with one another. The largest portion of reproducibility comes from an Operator-Sample interaction. In some way, due to the items measured characteristic, the operators measure different samples differently. This could occur when one or more appraisers aren't good with small parts, but can adequately measure larger parts, whereas others can measure all samples equally well. The Number of Distinct Categories is an indication of the discrimination of the measurement system. If the number of categories is less than five, the measurement system is of minimal value because it is difficult to distinguish one entity from another.